In addition to starting appointment times of every 30 minutes, our new feature allows you to offer starting appointment times every 15, 30 or 60 minutes. We built this feature to accommodate your clients who require shorter consults or for medication management. 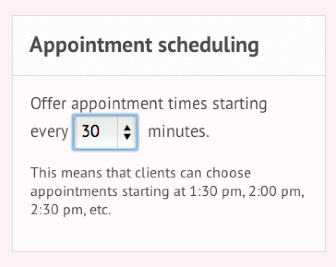 In your profile under “Appointment scheduling" you can select 15, 30, or 60 minutes. The default setting is set for starting appointment times every 30 minutes. If you select starting appointment times every 15 minutes, appointments would be available to clients every 15 minutes (e.g., 1:00p.m., 1:15p.m., 1:30p.m., 1:45p.m., etc.). If you select starting appointment times every 60 minutes, appointments would be available to clients every 60 minutes (e.g., 1:00p.m., 2:00p.m., 3:00p.m., etc.). Please make sure to check all client appointment requests against your calendar to avoid any calendaring conflicts. You are still required to confirm appointment requests as you currently do today. Clients will now have the ability to sign up for Breakthrough services under contracted and non-contracted payers (payers that do not have a contract with Breakthrough). A prospective client will have the ability to request an appointment with you even if their insurance is not contracted with Breakthrough, but you are a contracted provider with the appropriate payer network. Your profile displays the insurance you accept. 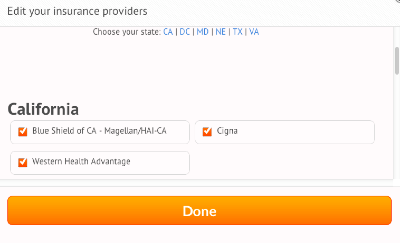 You can change this by going to your profile, under “Insurers Accepted” click “Add insurance” and select the insurance you accept in the "Edit your insurance providers" box. If an insurer is not listed in the selection, please contact us at 888-282-2522. A prospective client can search for a provider by a specific payer, and only providers contracted with that specific payer will show up in the search results. Additionally, during the sign up process a client is asked to provide insurance details if payment is by insurance. The client can select from a list of payers or select “Other.” If the payer selected is not contracted with Breakthrough, the client is directed to enter the insurance carrier telephone number and insurance ID number. If “Other” is selected, the client is directed to enter the insurance carrier name, telephone number and insurance ID number. In the first contact and with each subsequent appointment request from the client, the notification of appointment request/confirmation you receive will show the client’s payer name and if the payer is contracted with Breakthrough. For all clients, particularly for non-contracted payers, please verify eligibility and reimbursement for behavioral telehealth (i.e., payment for the GT modifier) as Breakthrough cannot guarantee reimbursement with non-contracted payers. Once a referrer identifies a potential client for services, the referrer completes a simple online form on Breakthrough. Breakthrough is notified of the incoming referral and will contact the potential client. The Breakthrough team will assist the client in identifying potential providers, and if a referring physician has provided your name, we will assist the client in connecting with you. If your referral sources would like to direct a patient to you, please instruct them to enter your name in the “Is there anything you want to tell the Breakthrough team about this referral?” section of the online referral form. 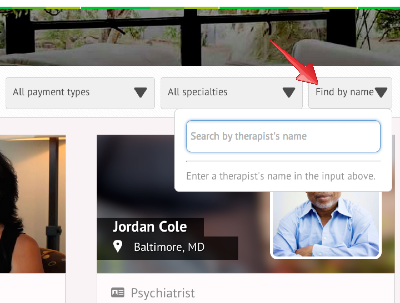 Potential and existing clients can now search for you by name on Breakthrough. So now you can tell existing or potential clients to easily find your profile page simply by entering your name in the “Find by name” option.